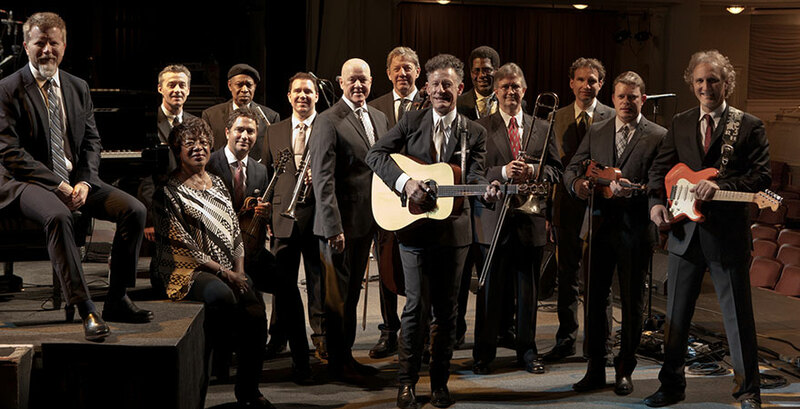 Lyle Lovett and His Large Band come to The State! Born and raised in Texas, Lovett found musical inspiration in home state song writers such as Guy Clark, Michael Martin Murphey, and Walter Hyatt. After graduating from Texas A&M University, he began writing songs and soon after signed a record label in 1986. Over the span of his three decade career Lovett released 13 albums, 25 singles, and won four Grammy Awards®. Some of his most famous songs include “Cowboy Man” and “If I Had A Boat,” both reaching top 10 on the Country Charts. Lovett generously gives credit to the other members of his Large Band. “Lovett manages to share the spotlight with all of them throughout the show,” said music critic Rob Clark in a review for The Eagle. The group, named after his Grammy®-winning album Lyle Lovett and his Large Band, incorporates 13 other musicians and vocalists. Performances with the group highlight not only Lovett’s musical talents, but each individual member of his Large Band, giving a full and all-encompassing musical experience unlike any other. Lovett is bringing all of musical talents and fellow musicians to State Theatre New Jersey on Thursday, August 10, 2017 at 8pm. Get your tickets now!